Heather Suzanne Woods is a scholar and teacher of digital rhetoric. She has been researching the relationship between technology and culture for nearly a decade. Heather’s research projects focus on rhetorics of futurity and innovation. Her most recent project analyzes the ways memes circulate to create public culture. 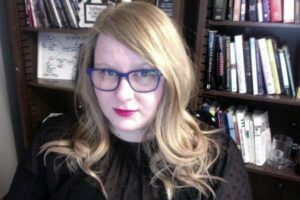 Currently, Heather is Assistant Professor of Rhetoric and Technology at Kansas State University. In recent past, Heather was a UNC Carolina Digital Humanities Initiative Fellow, a K. Patricia Cross Future Leaders Scholar, a UNC Center for Faculty Excellence Scholarship of Teaching and Learning Fellow, #FHN Digital Media Coordinator, and the Outreach and Assessment Coordinator of Project Vox.